Have you noticed how people will catch on to a ‘sound bite’? Someone makes a sweeping statement on facebook. They’ve done no study of the topic, but they saw half a documentary, so now they’re experts, sharing their sound-bite with other people, who haven’t even seen a news item on it, but now they’ve read a post, so they re-post and comment, for others to read and believe and share. Sounds a bit negative and cynical, doesn’t it? Apologies. But it’s true that for years, a popular sound bite has been misinforming people’s understanding of God. 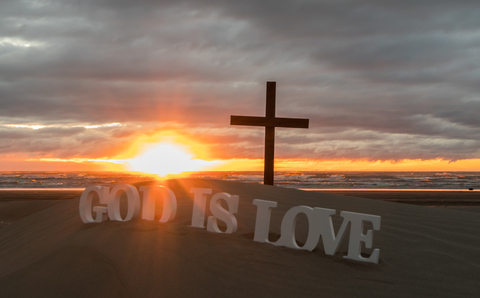 Here it is: “God is love”. The sound bite is true; if you want to understand love, God is the best one to learn from! But instead of looking at God, many people have assumed that the sound bite is the whole story. And instead of asking, ‘What does God say about love? What do God’s actions teach us about love?’ they have attached their own definitions. This week we ask what Jesus, God who became human, says about love, as he forms his new Kingdom. Here’s a preview: Love your enemy; do good to people who hate you; lend money to people you know won’t pay you back. Love is crazy; unwise, foolish, dangerous. In fact, love is when you treat other people the way you would want them to treat you. Love is how God has treated you and me. Jesus asks us to become like him, representing God accurately in the world, and inviting more people to become citizens of his crazy, foolish, dangerous upside-down Kingdom. We don’t do that by guessing what love is; we do it by following Jesus’ teaching and example. Jesus came, to die for people who hated him, so they can blessed by the God they didn’t want.